One of my employees, a widow, owns a shack in the township, and is in the process of building herself a better home. She hired help, made bricks and bought doors and cement. However, she has no house plan or bill of quantities. Last week, sadly, she was robbed of her wheelbarrows and doors. Do you have plans available with quantities and cost estimates, or any other suggestions that could help make her dream come true? Since your enquiry, I’ve had several more from Farmer’s Weekly readers. 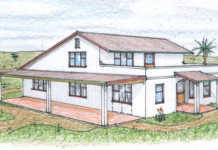 The request is always to build as cost-effectively as possible, whether it’s for a low-cost home or to accommodate visitors. 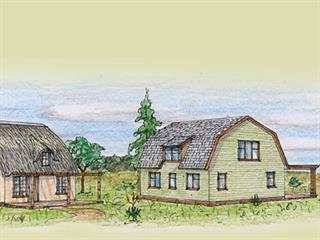 Shown here is a layout that would serve many situations – roofs to the rescue! While the higher pitched roof creates a ‘bonus’ area for use, it can be developed in stages as funds allow. This roofing style has been used for centuries in First World countries in the northern hemisphere. 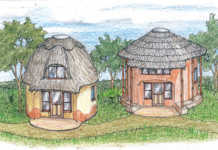 Shown in the right-side perspective is the typical mansard roof design while on the left side is a pseudo rendition of the early trekkers’ kapstyl roof – a home-grown rendition. I thought that as thatched roofs generally have a 45° pitch to them, why not pitch it a little higher on the sides and round it off to the apex. Doing this effectively creates a larger attic area for extra rooms. A shower/toilet can also be incorporated. The roof timbering and supporting walls below are also cost- effective. 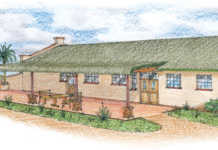 The thatch can be substituted with one of many other roof coverings on the market. I hope that all your efforts to help your employee build her house materialise.